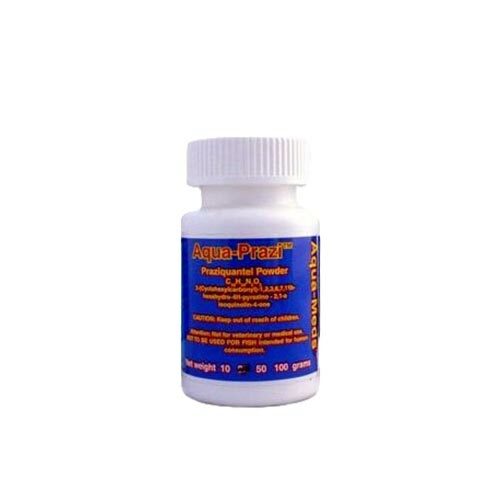 Aqua Prazi, 100% Pure Praziquantel, No Fillers, No added Medications! Aqua Prazi is one of the safest most effective medications on the market for treating deadly flukes; it does not stress your pond fish or set back your filter. Plus, Aqua Prazi is an excellent treatment for tape worms in goldfish, koi and pond fish. We suggest treating with Aqua Prazi every spring to get your pond fish off to a great season and again in the fall before their long winter's nap. Plus, treat all your new fish, very important! One gram of Aqua Prazi treats 100 gallons, 10 grams treats 1,000 gallons. Add Aqua Prazi to one quart of pond water and shake vigorously for 3 to 5 minutes. Add this mixture to a 3 to 4 gallon bucket of pond water and mix well. Two treatments work the best. The first treatment will kill all the live flukes. The second treatment, 3 days later will kill all the young as they hatch from their eggs.